Most grasses love our hot summers and have plenty of vigorous growth over this time. Now is the best time to start feeding and preparing your lawn for the coming winter months. The optimum time to do this is two applications of fertiliser; one in March and one in April/May. (before the weather gets cold) A fertiliser high in potassium will give your lawn protection going into the cold winter months. Potassium increases plant cell health and structure. Mow a little higher to give your lawn protection against frosts. 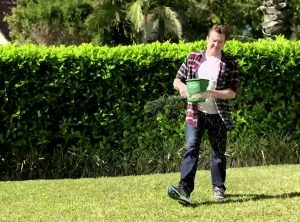 If you can time placement of fertiliser on your lawns until just before a heavy downpour of rain, this will help with soaking the fertiliser into your lawns and better outcome for healthier lawns during the cooler months.